Once the author submits the book proposal to the publisher, it undergoes two types of reviews—technical and editorial. The aim of the proposal reviews—both technical and editorial—is to decide whether to publish the book or not. 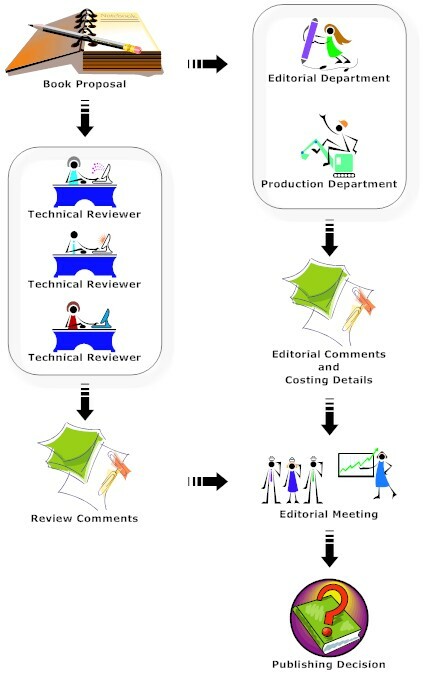 The technical review is usually done by three technical reviewers. Sometimes the publisher will decide to get the book reviewed by a single reviewer. The technical reviewers would be experts in the author’s field and would be familiar with the publishing process and the market. Most technical reviewers would also be successful authors or people who command respect in their field of specialization and who can verify the technical accuracy of the author’s claims and make sound predictions and estimates regarding the book’s sales. the author is qualified to write the proposed book. the book will have a market as indicated by the author. the book covers all the relevant topics that the target audience need. the author’s claims regarding books salient features, USPs, competing titles, etc. are true. the author’s writing is clear, error free, and is suitable for the intended audience. The technical reviewers would also give suggestions for improving the marketability of the book—addition of new topics or more coverage of existing topics, omission of certain topics, inclusion of illustrations, etc. They will also comment on the organization and may suggest reorganization for better clarity and continuity. They will be sometimes asked by the publisher to guesstimate the minimum and maximum number of copies the book would sell, the ideal price for the book, etc. Usually the publisher will give a questionnaire which the technical reviewers have to complete after reviewing the book proposal. The publisher will also do an editorial or internal review. The internal review will be done by the commissioning editor with inputs from the production and marketing departments. Here the editor will consider the factors like number of page, number of illustrations, type of binding, paper quality, cover details, cost of production, competition, marketability, etc. After completing the editorial review and after getting the feedback from the technical reviewers, the commissioning editor will collate the information and present it during the editorial meeting—a meeting attended by the publisher, editors, production personnel, designers, marketing personnel, etc. One purpose of the editorial meeting is to discuss the various book proposal reviews and reach a decision about publishing them. The fate of a book will mainly depend on the inputs given by the technical reviewers regarding the quality, price, and sales volume. Once the editorial board is sure that the book will make money or at least break-even, the decision in most cases would be to go ahead with the publication. But many times the predictions have been proven wrong! Published books with huge expectations have fared poorly in the market while books that were rejected by many publishers before getting published become bestsellers. So, the ultimate purpose of the reviews and editorial meetings is to mitigate the risk as one cannot, like in any other situation, predict future with absolute certainty. Thus in the publishing industry also, all one can do is do the homework well, estimate as best as one can, and hope for the best. If the decision is to publish the book, the publisher signs a contract with the author(s) and if the decision is to reject the proposal, then the author (in most cases) will get a rejection letter. Sometimes, if the reviewers have commented on the potential of a book in a new format with major revisions/additions/omissions, the publisher will convey the details to the author and ask him to submit a revised proposal.